My friend was moving to a wonderful flat situated above a baker shop, we discussed the marvellous delights of waking up to the smell of warm bread and baking on cold mornings it seemed such a lovely place. 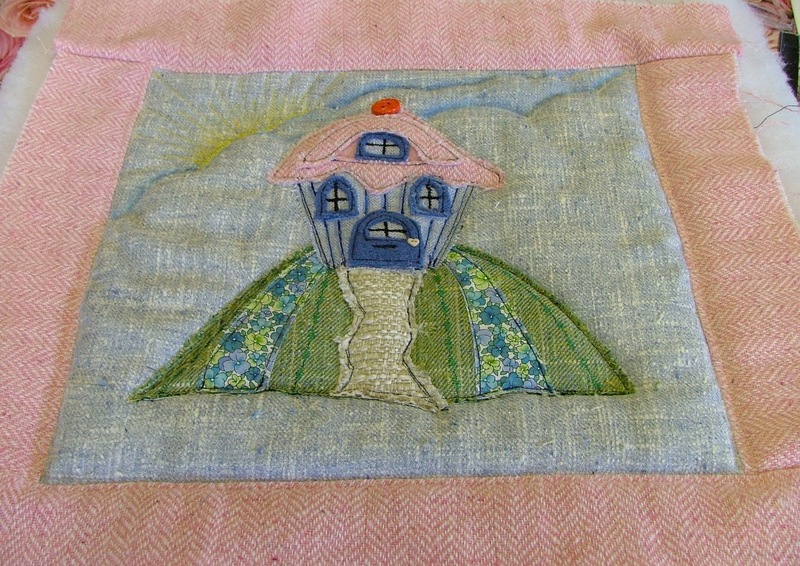 It was while I was making a card for her, using crayons I came up with the idea of a cup cake house, but then I realised it would also make a lovely cushion and a great a housewarming present – since we were coming into Autumn I wanted to use warm fabrics like wool and tweed – there is something really comforting about these fabrics in Autumn when all I can think about is cuddling up on the sofa with a good book as the evenings draw in. 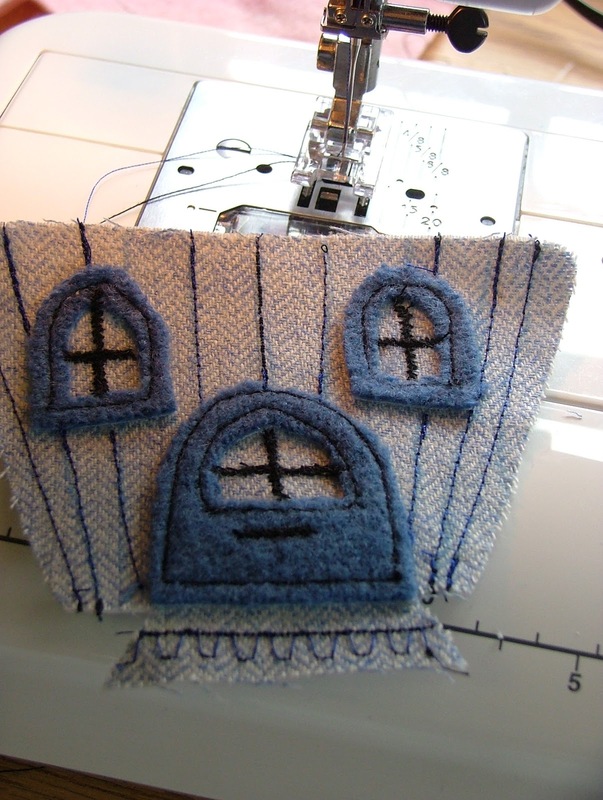 I love working with tweed, it is so soft and easy but can fray, so I made sure all the appliqué was backed – it is much easier to draw the outline on the fusible interfacing first then adhere the pattern to the fabric – then cut out it seals the edges much better. 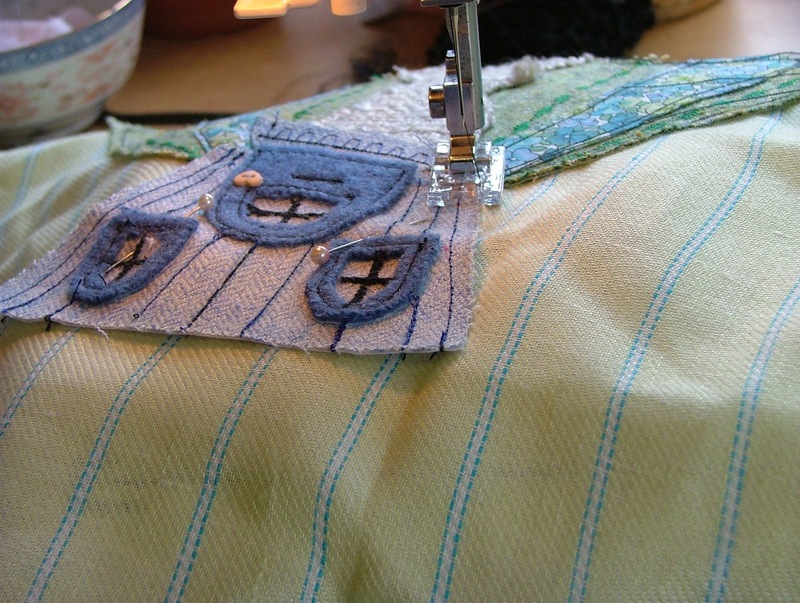 I took a square of fabric, and added a contrasting border – adding side strips first then adding the top and bottom. It was approximately 3 inch strips of pink tweed. Taking the hill template, I cut the background green then added the fabric strips on top, I loved the flower cotton and the curved edges added to the overall effect. The pathway was from beautiful textured tweed, which is why this is such a delight to work with. 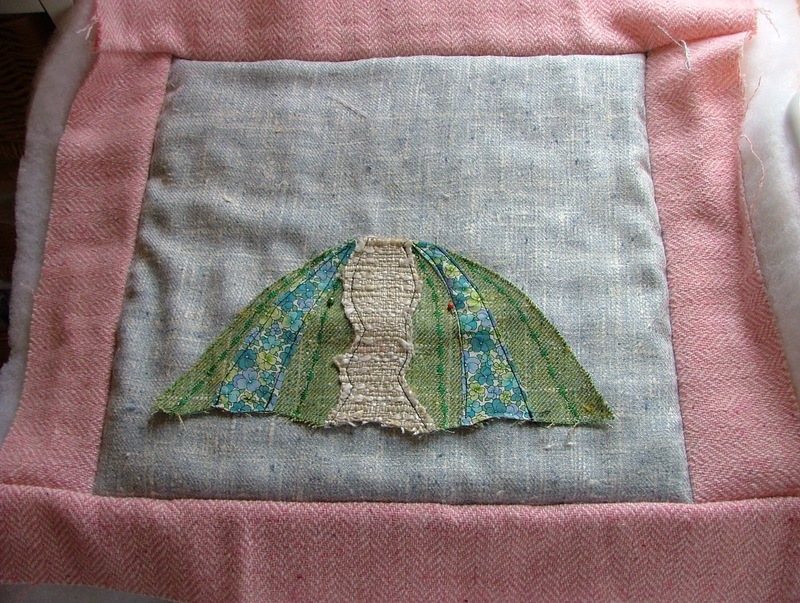 After attaching the hill to the cushion top I simply added decorative stitched lines in green to continue the flow – it looks just like an upturned umbrella! 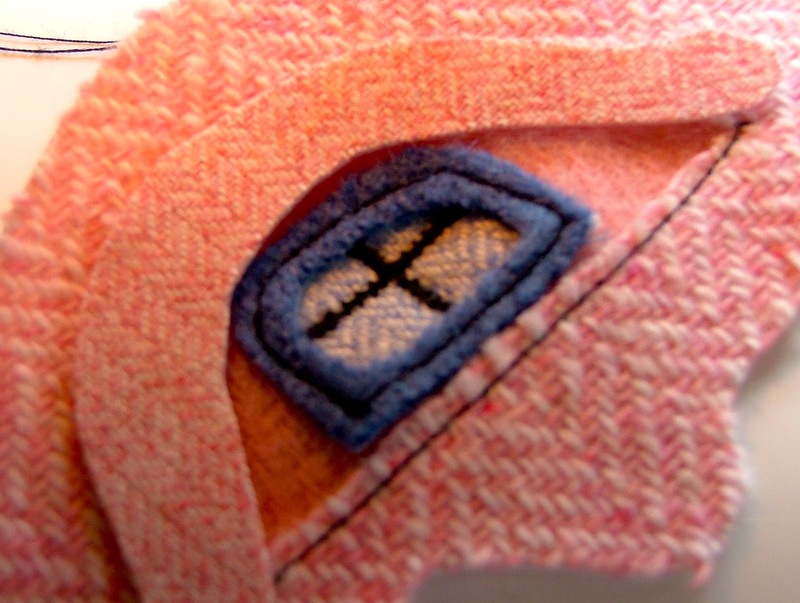 The top of the cupcake was made in layers, first I mad the little window, using a reverse appliqué technique topped off with a little machine embroidery. I added a little roof topping and used black stitching to give the child like drawing to the project. I found a delightful tiny heart shaped button in my stash that made a lovely door handle. As you can see I was considering using a different background while I was at this stage but in the end decided on the pale blue – I was concerned that the cupcake would not stand out enough but I resolved that by using the black stitching. 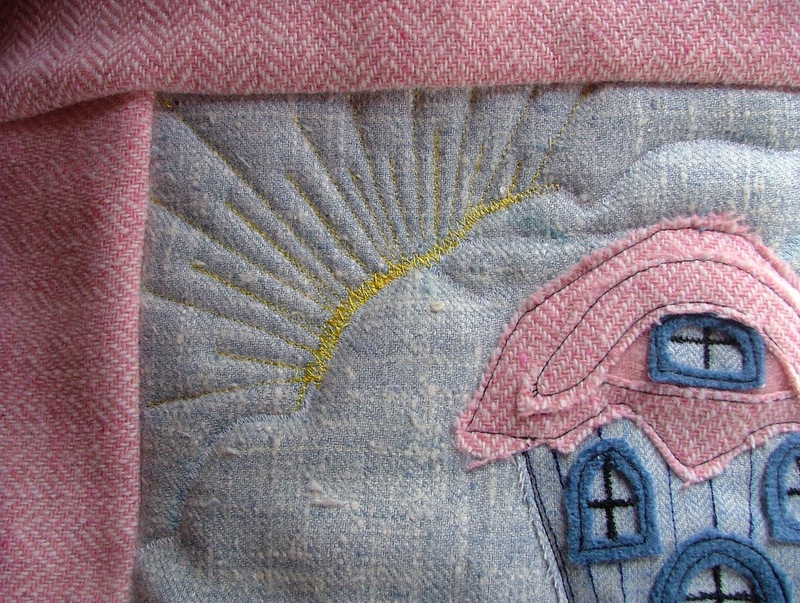 After backing the cushion with wadding, I quilted a cloud with the sun just peeping behind, using a simple zig zag stitch. I used crayons to increase the shading slightly to give a hint of colour change. 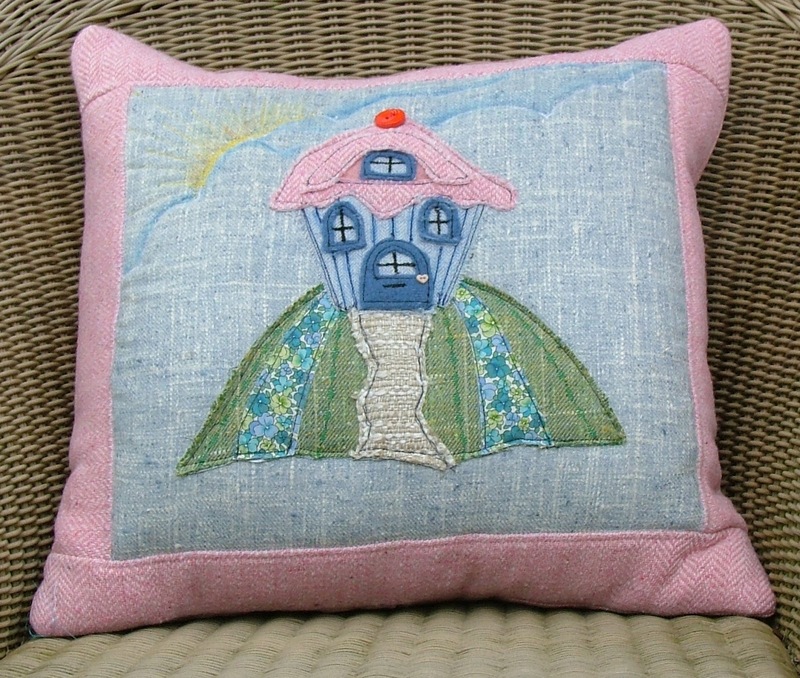 So the top was ready, I machine stitched the edges down now that the cushion had some backing it gave a lovely quilted effect, I followed the edge of the appliqué shape as well which gave it a little more depth. 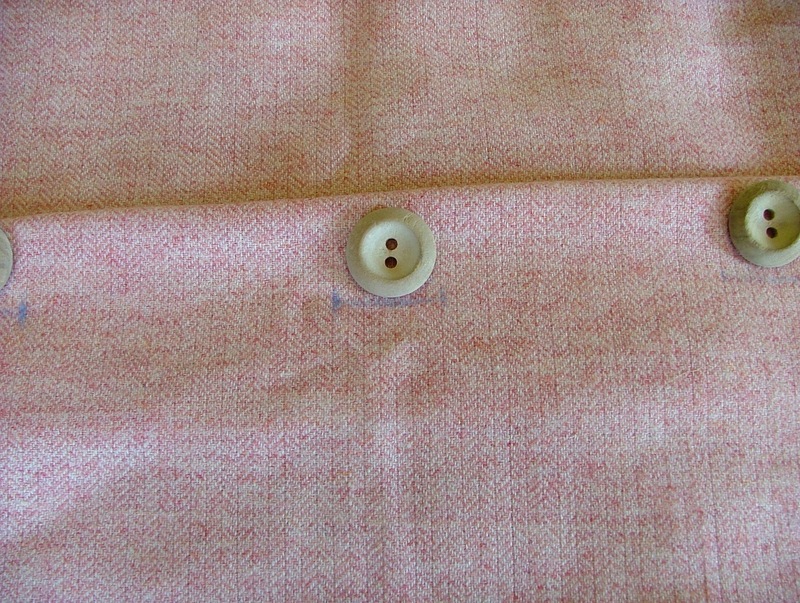 I also stitched my ‘cherry’ red button to the top. I felt a button closure was more important and used these lovely wooden buttons from a stash I bought in a charity shop. I always find it easier to mark out the button gaps before stitching otherwise I end up with the gaps either too big or too small! 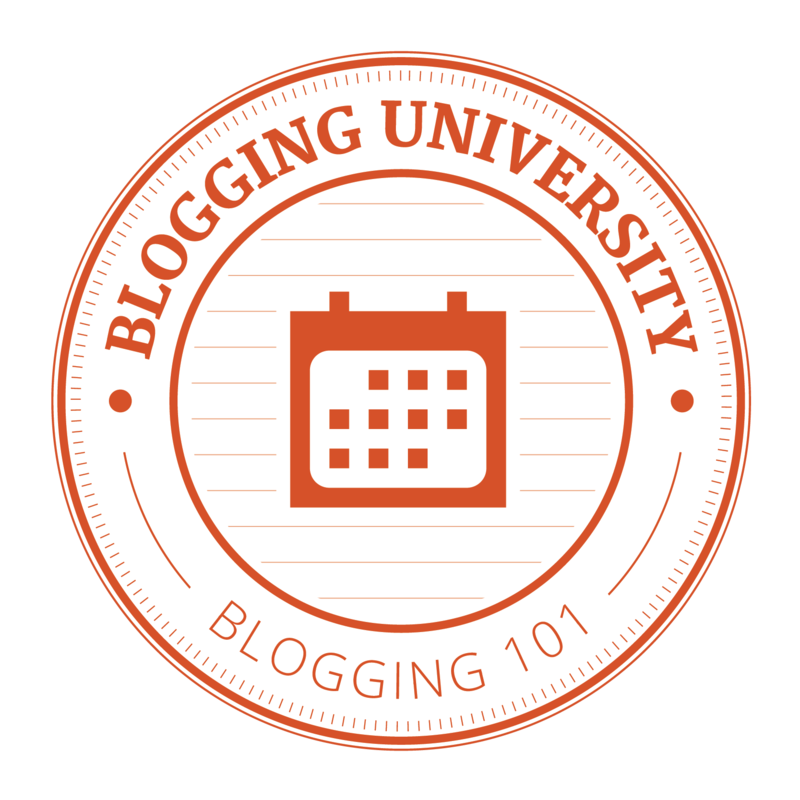 It also means that I have a good spacing, which tends to go awry when I do it by eye! As it was a gift I wanted to get it right! 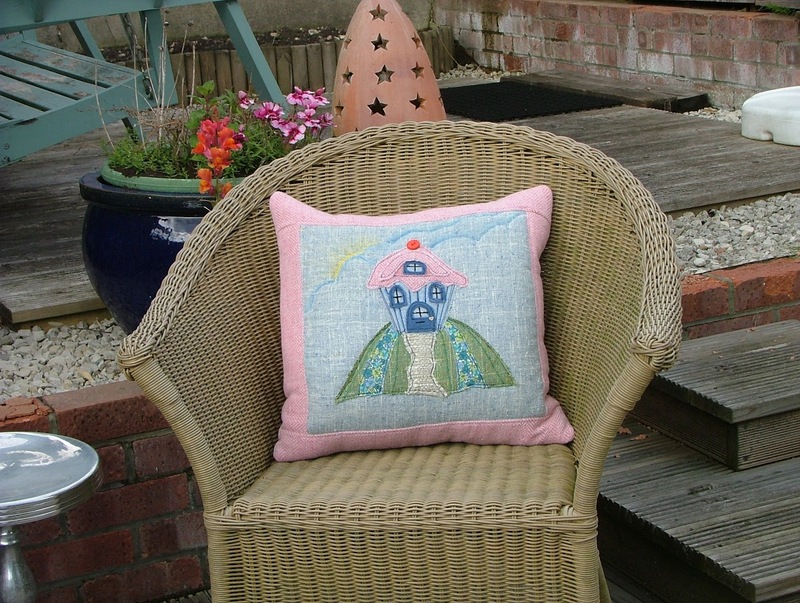 So here is the finished cushion, I found it hard to part with it! Maybe I should make one for me too now!